Doffers at the Bibb Mill No. 1, Macon, Georgia, 1909. Photograph by Lewis Hine. For a larger high resolution version of this image (168K), click here. Courtesy of the National Archives and Records Service. Learning to spin, ca. 1910. Photograph by Lewis Hine. For a larger high resolution version of this image (276K), click here. Courtesy of the Walter P. Reuther Library, Wayne State University. Girls enjoying a break from work, outside a Georgia cotton mill. Photograph by Lewis Hine. For a larger high resolution version of this image (180K), click here. Courtesy of the Photography Collections, Albin O. Kuhn Library and Gallery, University of Maryland at Baltimore County. 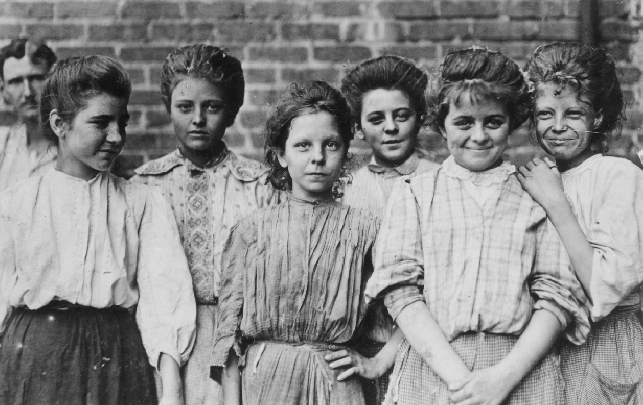 Children six to eight years old in the school at the Lynchburg Cotton Mills, Lynchburg, Virginia, 1911. There was no school for older children who, according to the teacher, "were just waiting . . . to go to the mill." Photograph by Lewis Hine. For a larger high resolution version of this image (156K), click here. Courtesy of the Photography Collections, Albin O. Kuhn Library and Gallery, University of Maryland at Baltimore County. Men opening bales of cotton at the White Oak Mill in Greensboro, North Carolina, 1907. 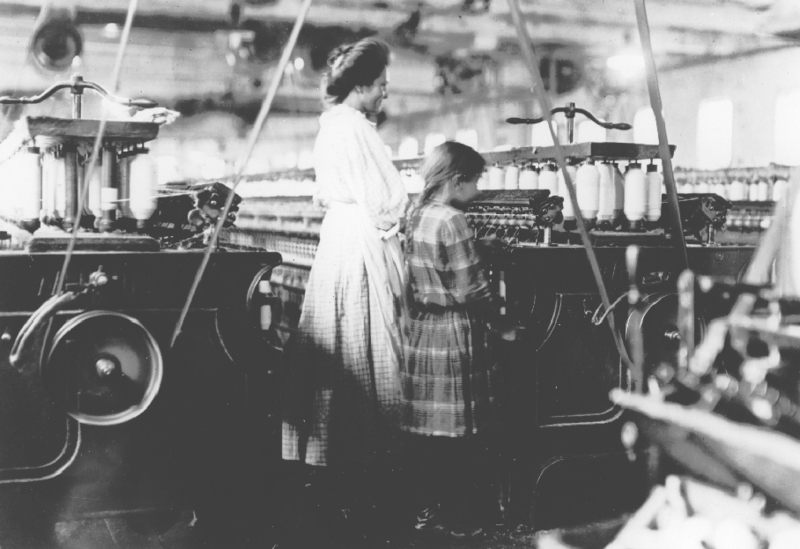 This was one of the few cotton mill jobs available to African Americans. For a larger high resolution version of this image (296K), click here. Courtesy of the National Museum of American History. The card room at White Oak Mill in Greensboro, NC, 1909. 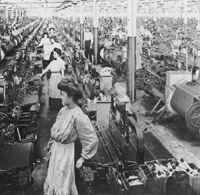 Fast-moving belts and powerful machines made carding a particularly dangerous job. For a larger high resolution version of this image (260K), click here. Courtesy of the National Museum of American History. 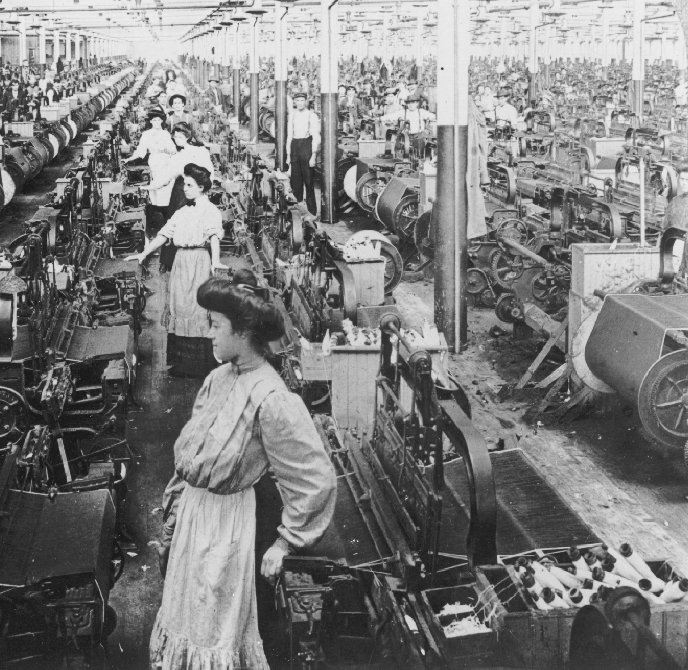 Men and women weaving at the White Oak Mill in Greensboro, NC, 1909. For a larger high resolution version of this image (340K), click here. Courtesy of the National Museum of American History. 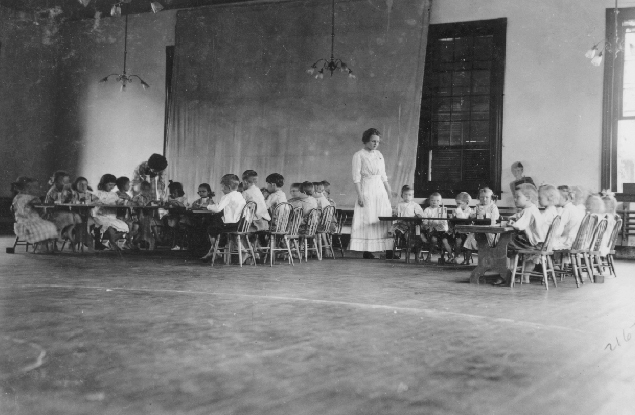 Welfare worker conducting a domestic science class at the Proximity Mills, Greensboro, NC, 1909. For a larger high resolution version of this image (188K), click here. Courtesy of the National Museum of American History. Caring for livestock, one of children's most important responsibilities. These children lived at the Wylie mill village in Chester, South Carolina, 1908. 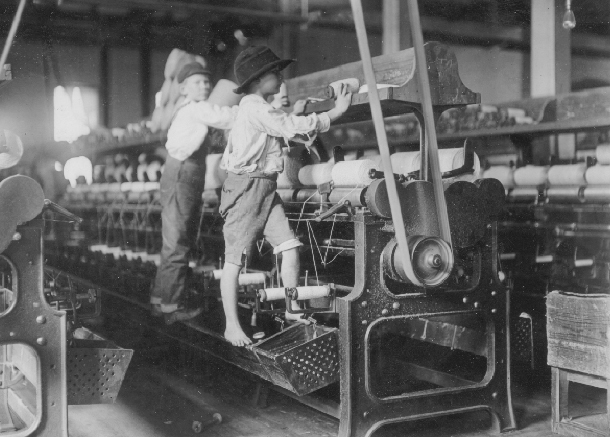 Photograph by Lewis Hine. For a larger high resolution version of this image (192K), click here. Courtesy of the Photography Collections, Albin O. Kuhn Library and Gallery, University of Maryland at Baltimore County.